When we say winter we automatically think of snowflakes, ice-flowers on our windows and plenty of love to melt our hearts. 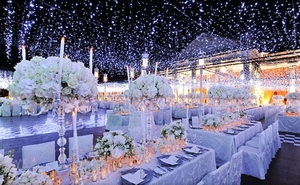 If you decided to have a winter wedding, you must know that your wedding reception will be just magical. A winter wedding not only that helps you cut down on your budget (as venues are considerably cheaper to rent), but it brings magic to your already perfect day, and it helps you understand its real meaning. Winter is the season when every person is waiting for the “miracle” to happen. So when they see a gorgeous princess coming down the aisle, they know that the miracle has happened. What else do we need for that moment to be unforgettable if not some amazing decorations? 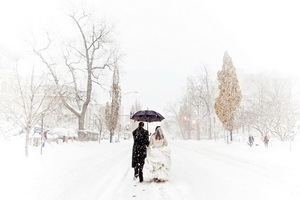 Here are some decorations that would make a winter wedding feel like a real miracle. As white feathers can be very easy associated with snow flakes, you just have to include them in your winter wedding decorations. Furthermore, if you want to look like the Queen of Snow yourself, you can choose to decorate your bridal gown with feathers, or to have a headdress made of feathers. You can also decorate your wedding cake with feathers and to have peacock feathers as table centerpieces. 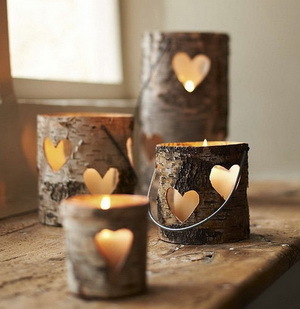 Wood is perfect for a winter wedding decorations because it takes us closer to nature. You can easily use twigs as support for Christmas globes, snowflakes, or even jewelries. If you have your reception in a venue that has a wood based interior, it is even better. Your wedding will have a rustic ambient and will make your guest feel closer to nature. 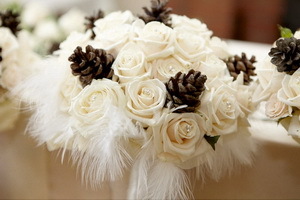 Fir cones would make a perfect contrast for a snow white wedding cake. By using shiny or metallic colors, you can create a charming atmosphere for your unique event. Have some glitter thrown on your wedding tables, dance floor, wedding cake and even on your bridal makeup. Your wedding invitations, thank you cards, favors and table centerpieces are just a few of all the details that you could use some special shine. And let’s not forget about your bridal shoes as they can also use some sparkles. Nothing can create a more romantic and peaceful atmosphere than perfect lighing. No matter if you decide on floating candles, chandeliers, colorful LEDs or just simple scented candles you cannot go wrong either way.